What were your motivations behind getting your first tattoo? Ursula: My 18th birthday - the fact that I was finally legally allowed to get one and I wanted a symbol of strength on my arm. 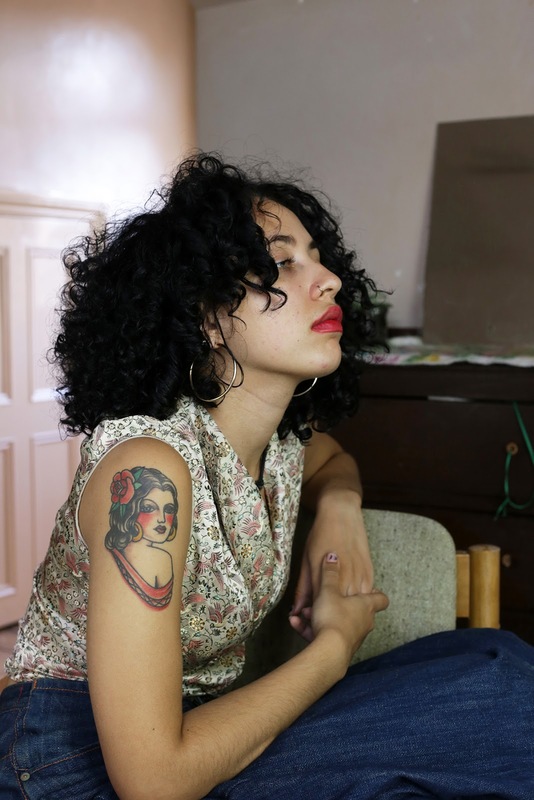 Delilah: Tattoos are my beauty ideal. When I think of beautiful things, I think of tattoos. I love alternative beauty. I first knew I was gonna get a tattoo when I was eight years old. Do your tattoos symbolise something in particular? Ursula: It's a combination of my inspirations from my obsession with Botticelli's depiction of Aphrodite and classical artworks of Venus. They have always resonated with me, which probably ties into the fact that I'm a Libra ruled by Venus. I saw the strength in the goddess and wanted to also incorporate 'The World' tarot cards, goddesses’ stance and 'Empress' tarot cards mother earth demeanour. I love 18-19th century wiccan and occult artwork. I also absolutely adore the works of Sutherland MacDonald as I think his tattoo style is the definition of perfection and definitely wish I could get a tattoo done by him. Delilah: I have an affinity with traditional tattoos so I knew from eight years old that I wanted a lady in red on my arm. My tattoo symbolises to always stay beautiful. Because in the past I've struggled with the way I look and I've been really insecure. I got bullied a lot throughout school for my appearance and the way I dressed. So when I was 18 I wanted to get the tattoo to remind me of how far I've come on the journey of self-love. Your mum is heavily tattooed and I wonder if and how that influenced you growing up? Ursula: It was never something that I saw as abnormal. I've always wanted a tattoo, probably due to the kind of bohemian-style, punk parents I have. It felt like nothing growing up because I think I already felt different at school. So to see my mum at the school gates with all her tattoos and dreadlocks down her back with tons of piercings felt like the most normal thing ever. Me getting a tattoo was a basic way of expressing who I am on my skin and not much of a rebellion. My mum definitely is one of the biggest inspirations in my life and as a black, tattooed, outspoken alternative woman in our society she's challenging the norm. Delilah: Definitely. I always have and still do think my mum is one of the most beautiful, inspirational people in the world. I look up to her a lot and I've always admired her strength and courage. My mum’s definitely made an impact on what I perceive to be beautiful. How did you feel when you first went on stage with your new tattoo? Did you think about how your tattoo would form part of your presence on stage before you got it? Ursula: I got it on my right arm because I know that my body will always be facing left when playing drums. I think because I'm indecisive it helped me choose which arm to get it on. I think you can be badass with or without a tattoo, but as a young female it's nice to get something society sees as a somewhat a masculine thing. We're already in a punk band so I had nothing really to lose challenging the preconceived ideas of gender specifics. "Tattooed drummer in a punk band" doesn't exactly scream 19-year-old girl. 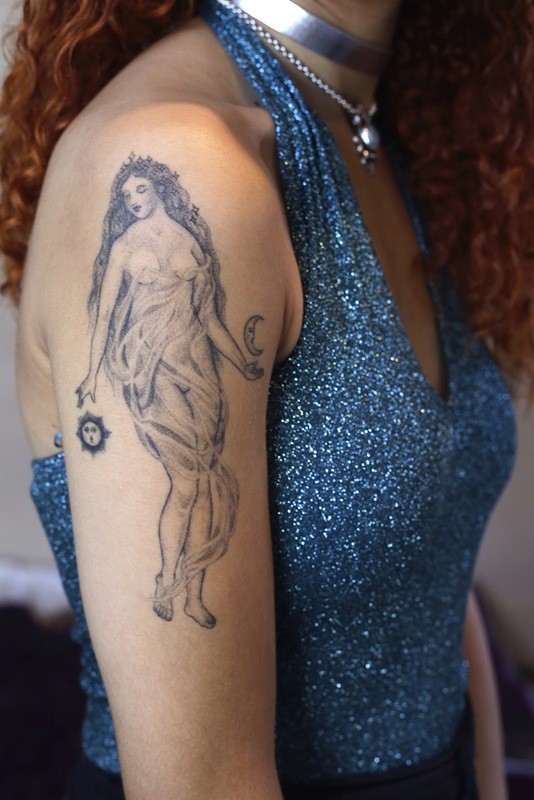 Delilah: To be honest, I forget I've even got a tattoo. No, I wasn't really conscious because it's a part of me. When I do remember my tattoo it gives me more courage and confidence. I think tattoos are such a big part of my life I don't think of them as a statement thing after being raised by my mum. 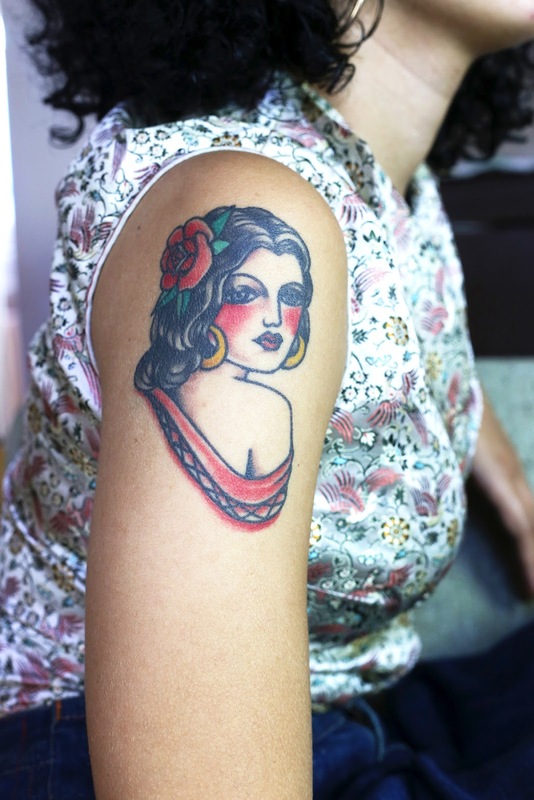 Do you think that women with tattoos are treated differently to men with tattoos? Ursula: Yeah, getting stereotyped as "the crazy rock girl", but then again is that a bad thing? You can't control people's preconceived idea of you, I guess, but anything that puts people off is probably a good thing as the masses are asses. Can tattoos be political? I'm thinking more broadly, but also in the context of body politics and feminism. Ursula: Yeah, apparently in Japan only gangsters have visible tattoos so I guess over there it's a real statement. I'm not sure how political tattoos are now due to popular culture. Tattoos aren't as much of a statement anymore. Rihanna has a hand tattoo and neck tattoos on celebrities are pretty common now. It's crazy how different it is now in comparison to when women with tattoos would be in freak shows and men would either be sailors or prison inmates. 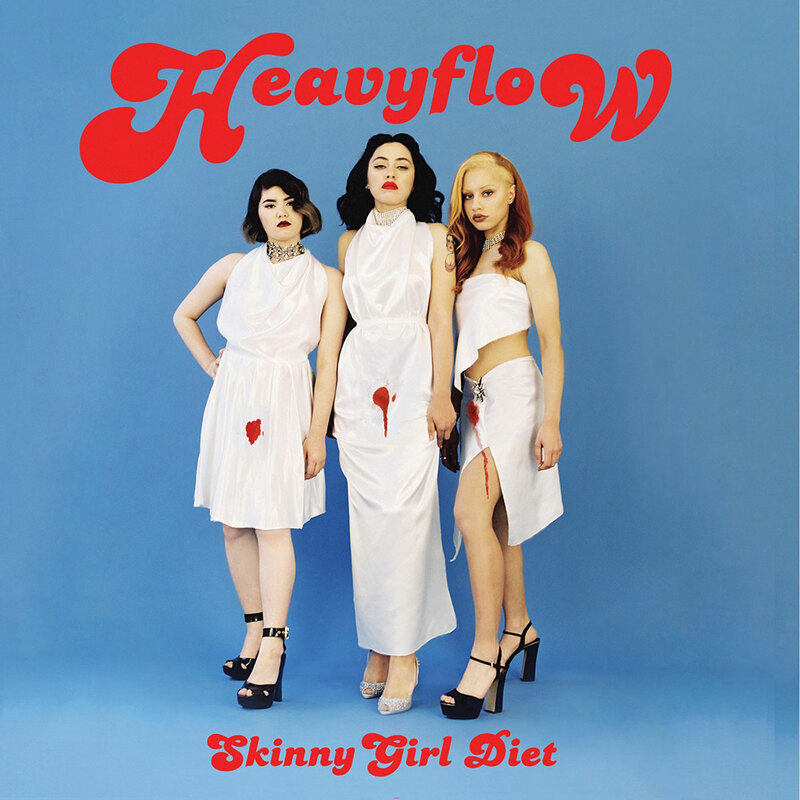 On a non-tattoo related note, I was wondering if you could you tell me about the amazing album cover for Heavy Flow. What does it signify? Ursula: It's a satirical piece that signifies female energy, raw, unapologetic. If you identify as a woman or feminine energy, it represents the pain and blood women have bled due to just being female. In body and in issues that are going on in the world from FGM, standing with our sisters in a powerful image.